Engineered answers to the high cost of logistics. Trans-solutions helps freight shippers and third party logistics companies reduce freight costs and build best-in-class transportation operations. Our fact-based, numbers-driven approach results in recommendations you can trust. ROI in 3 months or less on many cost reduction projects. Optimize your distribution network at a fraction of the time and cost of large-scale studies. 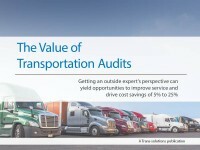 Getting an outside expert’s perspective can yield opportunities to improve service and drive cost savings of 5% to 25%. Get inside information to arm yourself for successful carrier negotiations. We love solving freight transportation challenges! It’s what we do every day for companies large and small.